Delhi Mughal Garden is one of the most renowned and famous garden of Delhi due to its history and beauty. It is located inside Rashtrapati Bhavan, first citizen of India lives in this house. Construction of President house was started in 1911 and it was completed in around 17 years. Mughal Garden is located in the backside of Rashtrapati Bhavan. 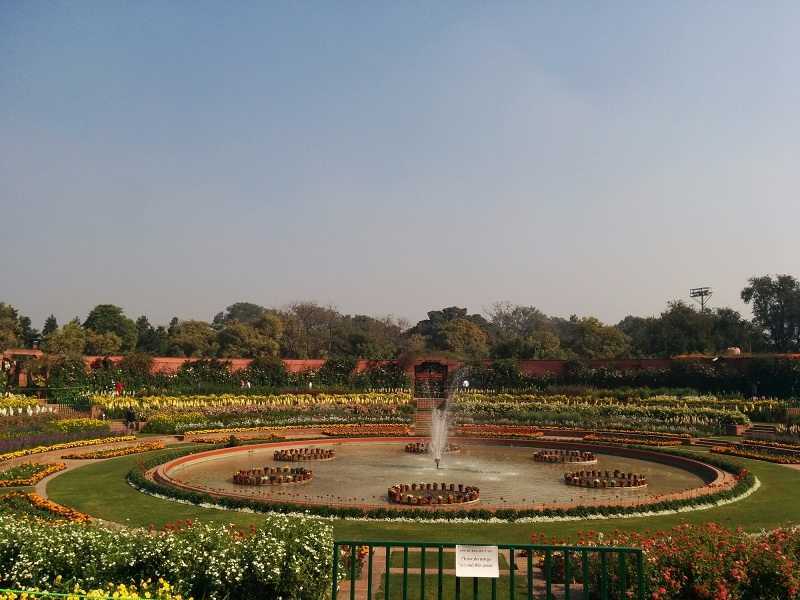 Many Mughal gardens are built in Asian counties, however, Mughal garden of Delhi is most famous one due to its location, beauty, collection of flowers, accessibility, etc. Mughal garden Delhi was constructed in Presidents’s hose from 1911 to 1931. It was influenced by Persian style of architecture. It houses large variety of flowers and some of them are only found in only Rashtrapati Bhavan Mughal Garden. Mughal garden is consist of some other gardens like main garden, long garden, Terrace garden, Circular garden, butterfly garden, etc. It is spreads in a large area of around 13 acres and many of people can visit this garden at a time without any difficulty. It has some water channels, fountains, man made water ways, lotus-shaped fountains, etc which add more beauty to this place. 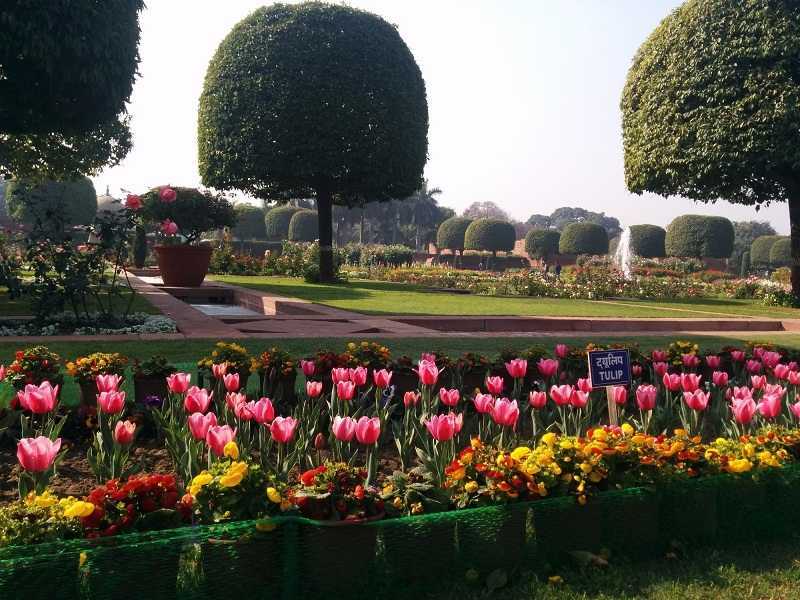 Every year Mughal garden remains open for general public from February to March. Park opens during the Udyanotsav, which held every year from February to March. 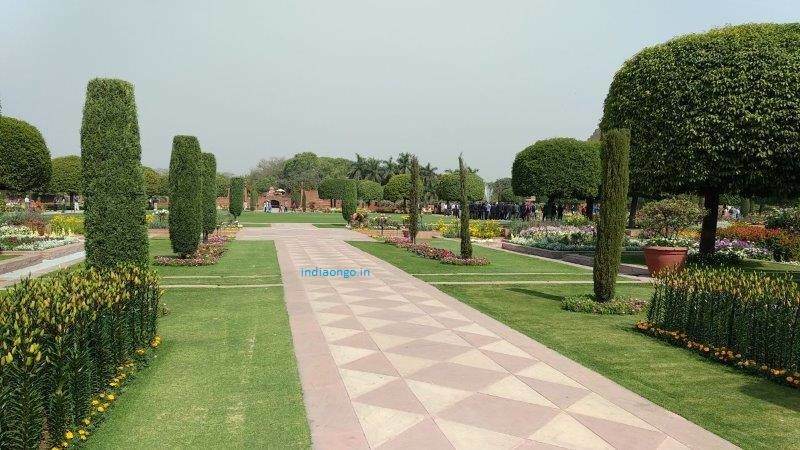 Mughal Garden Opening Date is 6 February 2019 (Wednesday) and closing date is 10 March 2019 (Sunday). Garden opening time is 9.30 AM and closing time is 5 PM. Last entry to the garden is allowed till 4 PM. Garden remains closed on every Monday due to maintenance work. Entry is completely of Mughal Garden during the period of Udyanotsav. There is no tickets for entry in the garden, however, visitors are advised to bring any type of ID card to get the entry in the most secure premises of India. Rashtrapati Bhavan is one of the most famous location of Delhi and all modes of road transport are available to reach there. Nearest Metro Station is the central secretariat of Yellow line. Distance from the metro station to the entry gate 35 is around 2 KM and this distance can be covered via auto, cabs, etc. Auto Rickshaw charges 50 Rs from metro to Mughal Garden and in sharing mode, they charged 20 Rs per passenger. Entry is allowed from Gate no 35 of President house. The road going towards the gate number 35 of Rashtrapati Bhavan is located opposite to RML hospital (North Avenue Road). Apart from the metro, visitors can reach here via private vehicles, city bus, auto and cabs. Free drinking water, toilets, first aid facility is available in the premises. Garden is spreads in a large area, therefore, benches are installed in the park for some rest. Parking facility is available outside the gate, however, it is a bit challenging to find a parking place on high crowd day. Public transport is recommended to reach the Mughal Gardens. Mughal Gardens is located inside the Rashtrapati Bhavan and it is most secure area of India. As is is located in high security area, visitors needs to enter into the garden after proper security check. Staff is cooperative here. Visitors are advised not to carry any additional items along with them. Only ladies purse and mobile phone are allowed in the Mughal Gardens. Bags, camera, umbrella, water bottles, food, etc are not allowed inside the premises after security check. A cloak room is located there to deposit restricted items. It recommended not to carry any other item than mobile, as it will waste the precious time in the queue. I hope this information is helpful to Mughal Garden visitors. We have gathered this information from various sources and put it in one place for the convenience of our site readers. You can leave a comment to know more about this place and we try our best to help.